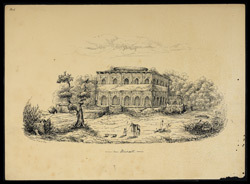 Pen and ink drawing by Frederic Peter Layard (1818-1891), after an original sketch dated August 1839, of a tomb with a collapsed dome at Meerut in Uttar Pradesh, dated 1843. Inscribed: 'near Meerutt. Sketched August 1839. F.P. Layard Eled(?) on the River Chenab Octr. 1843'. Meerut is an old city situated north east of Delhi which, from 1806, was the site of a large British military cantonment. There are a number of Islamic buildings in the city including the Tomb of Pir Shah and that of Makhdum Shah Wilayat, the Jami Masjid and Maqbara of Salar Masa-ud Ghazi.